Make a Gold Sequin Cake in minutes rather than hours. You can also forget about buying any of those expensive, rock hard edible sequins too. This informative video will show you how you can use the “Confetti Already” Simpress™ to produce incredible sequin textured panels in delicious fondant. Only in a video can you see first hand just how much each panel appears to be perfectly covered by edible sequins, when in fact, they are simply amazing impressions in fondant. 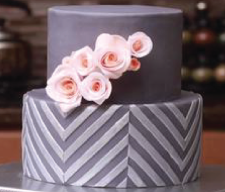 Learn how to panel a cake and also how to quickly finish it in a gold color application that transforms a simple 8” cake into a centerpiece all will admire. Nothing beats a good video to show how something is done better, faster and less expensively. We are sure you will find the demonstrations in this video very valuable and empowering if you ever have wanted to create this very popular cake.